YAY ITS FRIDAY! Time for some FWF (Friends with Flair)!! Be sure to check out all the beautiful creations over at the Unity Blog... Find the blinkie and make sure to leave some LOVE, you could win 25 random UNITY STAMPS!!! How awesome would that be? Unity Stamp Co. is my FAVORITE stamp co. I LOVE their stamps, they are cute, fun and fabulous! I love receiving my KOTM (Kit of the Month) each month, its packed with yummy Unity goodness. If you haven't heard about the KOTM club, hop on over to Unity's website and check it out. You wont be disappointed! Heres another project im working on, I finished the main element and wanted to share it. When the projects complete I will share it again. But I wanted to show I think im getting my shading down good with the Copics, don't ya think? Im watching all the videos I can. My daughters a squirrel fanatic so this lil project will be for her. 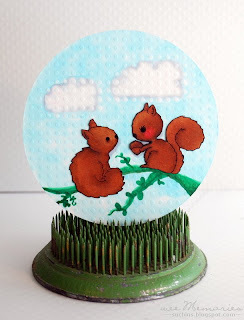 I got the little squirrels from a digi-shop on Etsy, I gotta look up the info so I will add that to this post tomorrow. If you ever wanna know the Copic colors I used, just leave me a note. Hope you have a fabulous FRIDAY! TGIF! Love the pics of your kiddos! Hey, trying to figure out all the details, so you can see my updates. Not sure I understand all the lingo yet. So sorry! Have a wonderful weekend! Your card is adorable! Your nephew and daughter are soo cute! Have a wonderful weekend Jenny! Love this card and the vellum overlay Jenny! Gorgeous! Such fun with two little cousins hanging out...and yup boys will be boys. Your coloring also looks wonderful...I'm so excited I'm taking a Copic class the latter part of April! Love your cards! I joined Unity stamp club for last week, I cannot wait to get my first stamps! Very cute creations and your children are super cute!! Your cards and kids are so cute!! TFS!! Wonderful Jenny! Love the ladybug card! You did a wonderful job shading with the copics! Super cute cards! Those kids are uber cuteness as well! wonderful creations.. wow.. love your Unity card! I can't wait to get my kotm any day now! 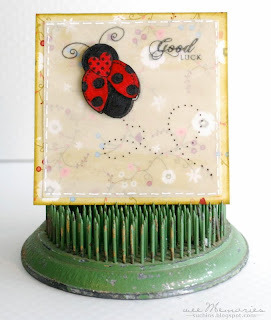 That ladybird card is lovely and I luv how you used the vellum. this so cute love how you used the vellum!!! super cute - love the good luck with the ladybug!! These are both so cute..and so are those kids!! Love the pictures of your kids...Great cards, that ladybug is too darn cute. GREAT cards!!!!! I also LOVE the kid pictures...SO CUTE!!!! TFS!!! Adorable card and double adorable kids! wonderful cards!!! i love what you did with the ladybug!!! aww what cute cards and kids!